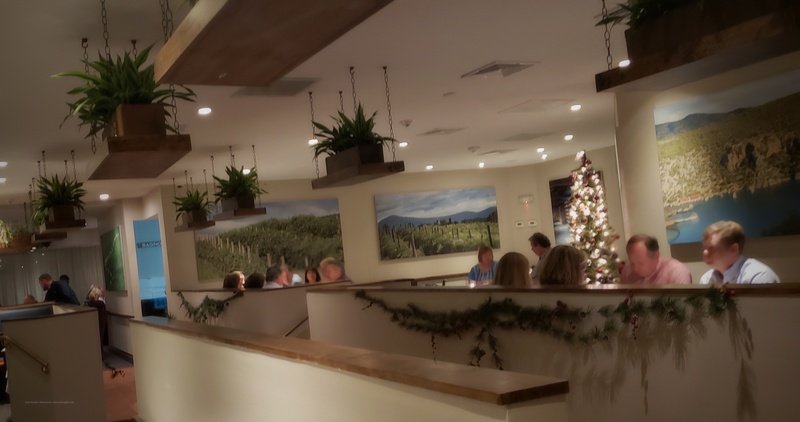 Trip Advisor lists Cafe Mezzanotte as the number one restaurant in Severna Park and after dining there over the holidays I can understand why. First impressions always count and I had a lovely young hostess greet me with a smile and warmth that initially set the tone for what was to come. There was something about her sense of caring that made me feel she might be related to the owner, Kosmas “Tommie” Koukoulis. Koukoulis is also the owner of Uncle’s Hawaiian Grindz in Harford County. Cafe Mezzanotte recently went through six weeks of renovations, opening up spaces, new furniture, artwork and interior décor. Large photographs of scenes from Italy and farms overlooked tables in multiple dining rooms. The farm theme in the photographs supports the restaurant’s strong commitment to buying from local farms, seasonally and wherever possible eliminating supplies that are GMO. There is a strong sense of supporting the local community – in fact, 50 cents is added to each check as a donation to The Food Project that educates and trains southwest Baltimore youth in food-focused skills. Our waiter, John, also had that positive – sense of ownership attitude. He was knowledgeable, attentive but not intrusive and handled our special requests with aplomb. My companion wanted the Branzino as her main course, but just couldn’t eat it with the head still attached BUT for photographs, the fish arrive complete, photos snapped and back to the kitchen for beheading. Along with the dining rooms, there is a lounge that offers up a specialty menu of appetizers, flatbreads, and create-your-own pasta bowls. Happy hour has discounts on food and libations Monday through Friday from 4 pm to 7 pm ($3 off all lounge appetizers, $2 off all dinner menu appetizers and $1 off all drinks). As a guest of Mezzanotte, we indulged a bit more so we could taste a selection of their offerings. 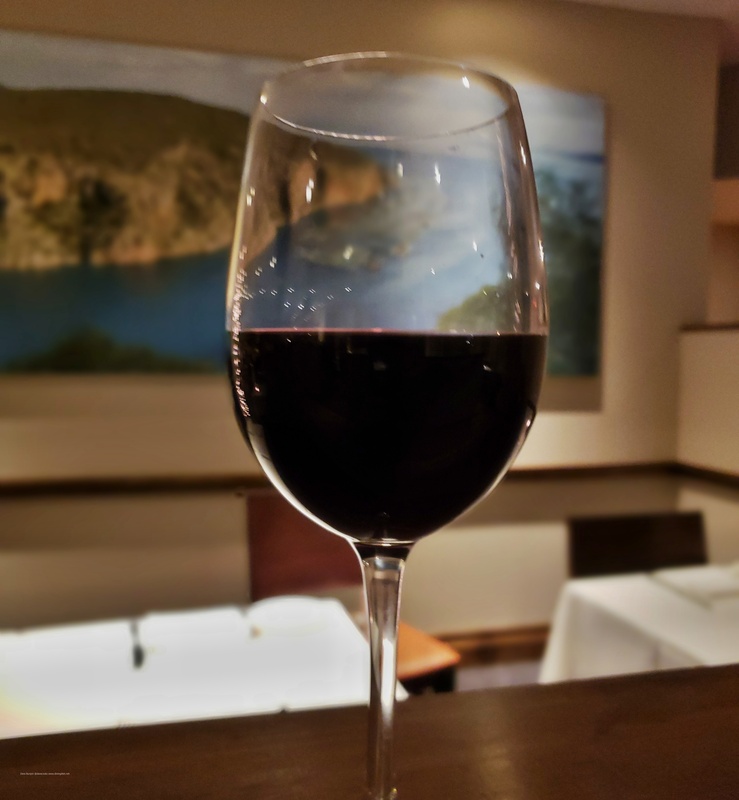 My companion and I went with our waiter’s suggestion on wine, Super Tuscan – Campo Al Mare-Bolgheri. There is a good array of wines to choose from: by the ‘glass’ starts at $7 and by the ‘bottle’ in the $30 range. 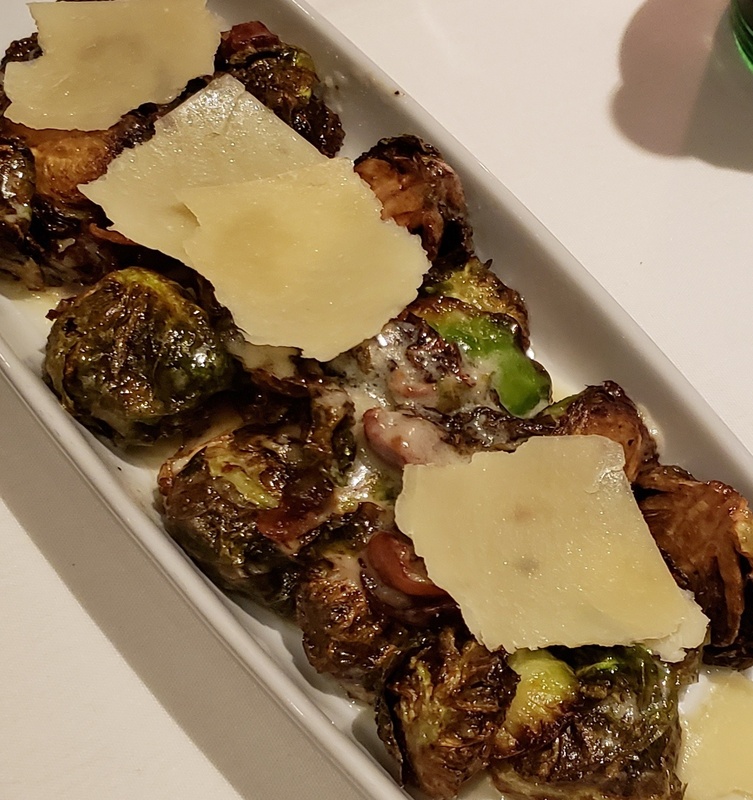 Our appetizer selections: crispy Brussels sprouts topped with prosciutto, honey sambuca cream and shave grano padano – a nice rendition: very rich, a splash of lemon would have taken it to the next level. 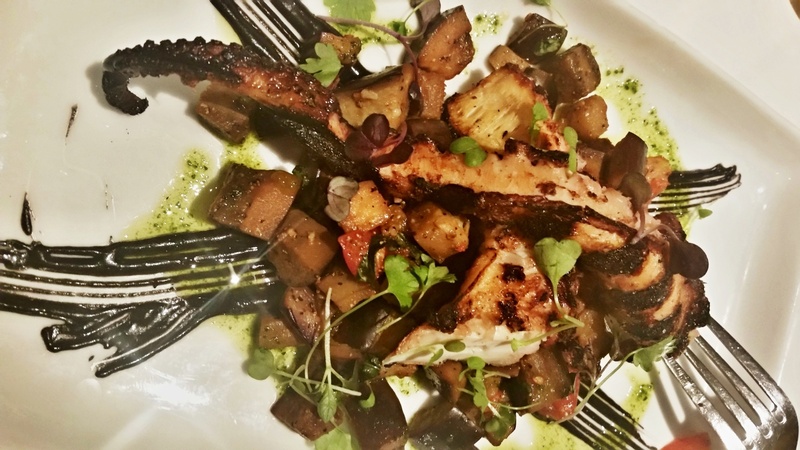 The charred octopus, roasted eggplant and tomato salad, like the Brussels sprouts, was a large portion – both could easily be shared. 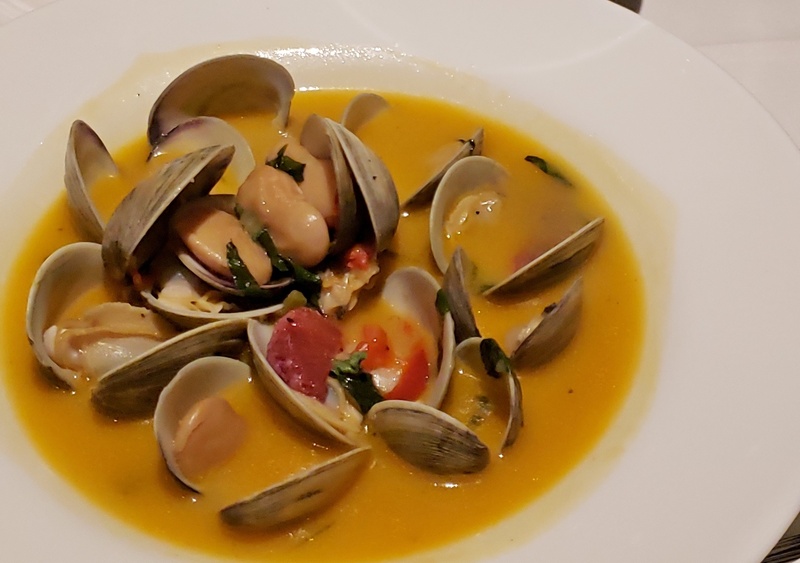 We also indulged in the clams brodo – littleneck clams, blood orange fennel fumé, chili paste, Gigante beans, and lemon oil. This dish is traditionally prepared with Italian chili flakes, although their preparation with chili paste took on a bit more heat/spice. Along with our entrees of the above-mentioned Branzino and the veal osso buco, we wanted to try a pasta dish which we left up to our waiter to surprise us with his choice. 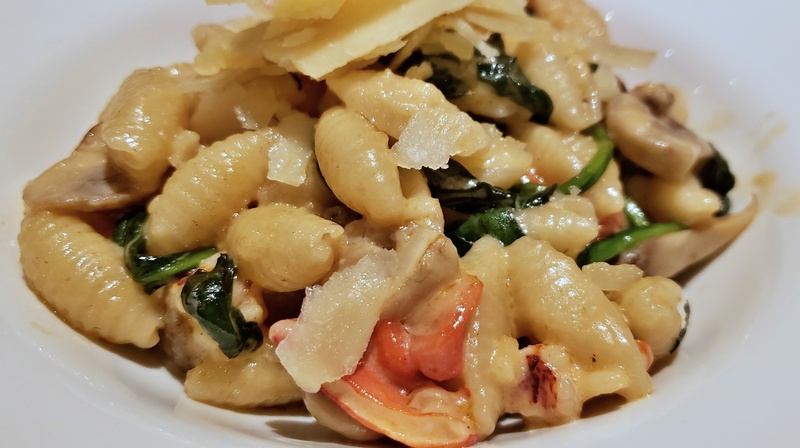 We were indulged with the lobster cavatelli; pieces of cold water lobster, roasted red pepper, spinach, garlic mushrooms, lobster buttercream and shaved Reggiano cheese. Note that one can order ½ portions of pasta though it isn’t noted on the menu. 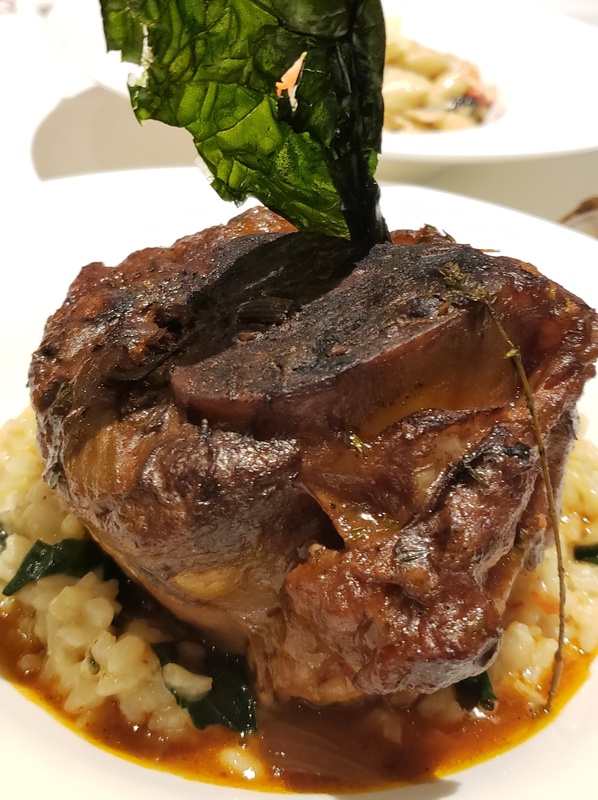 The osso buco, well – it was huge – 16 Oz, a hind shank presented with butternut squash risotto, white bean, Parmesan braising jus, tomato demi glaze. Most of this dish came home with me that evening, although, I did indulge at the restaurant by spreading the bone marrow on their crusty bread – very decadent. Yes, we were full, but who can deny themselves a slice of house-made cheesecake with the unusual topping of pepitas and a raspberry sauce. Depending on how you like your cheesecake, this was more to the creamy side than with a dense cake like preparation. The menu indulges in Italian and Italian American selections so there is something there for anyone’s taste. Reservations are highly suggested.